Originating in the dry regions of South Africa, the Dwarf Jade, or ‘Elephant Bush’, is a succulent plant, which explains its ability to store water for a long time. It is a very undemanding plant, well suited for individuals who travel often or who are prone to forget to water their plants. Thick, round, dark green leaves and delicate pink flowers sit atop fleshy stems and branches. These succulent features hold water for long periods of time. 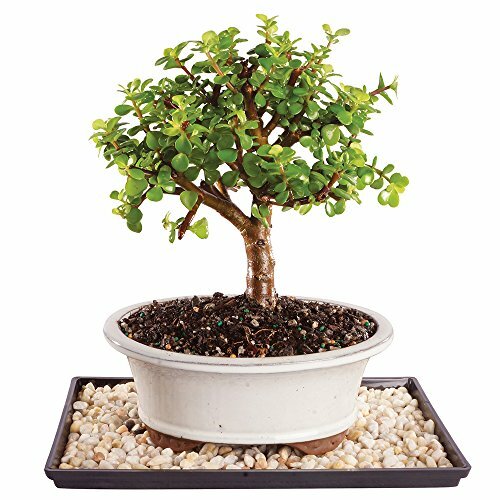 Though it grows to heights of 10 feet tall in its native habitat, it is an ideal bonsai for a beginner; this beautiful plant is easy to care for and will be a thing of beauty for years to come. Comes with Humidity tray and decorative rocks to counteract the effects of indoor dryness and outdoor windiness. Excess water collects in the tray and slowly evaporates; increasing the humidity around the tree and improving the growing environment. Your bonsai tree thrives while windowsills stay dry and debris-free. A tray can also be used outdoors to improve conditions in dry or windy sites. Each live plant is shipped with the Phytosanitary Certificate as required by the USDA. SPECIES: Thick, round, dark green leaves and delicate pink flowers sit atop fleshy stems and branches. These succulent features hold water for long periods of time. AGE: This Dwarf Jade Bonsai is 5 years old.